Some moves carry an innate weakness, but you can turn this weakness into a strong point. For example, when you adjust your leverage advantage to fell an opponent, he may strike you or fell you instead. You can prepare beforehand this possible scenario. When the situation arises in free sparring or real fighting, you exploit the opponent's counter to defeat him. In Chinese (Cantonese) this is “cheong khai chow khai”, which is word-by-word “let trick manifests trick”. It means that when an opponent attempts to use a technique or trick to defeat you, you use his same technique or trick and turn it around to defeat him instead. This strategy is very effective in combat as well as in daily life, and often wins the admiration of your opponents especially if you are magnanimous in victory. 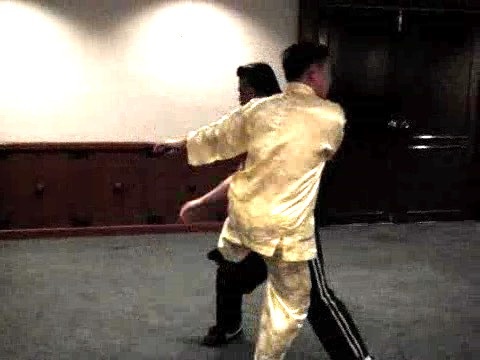 A practitioner uses the Double Dragon Hands to ward of a Boxer's attacks. When an opportunity arises, he closes the Boxer's hands, and counter-attack from a side. Grandmaster Wong suggests that he can fell the Boxer, keep him under control and strike him. As you move into an opponent to fell him, there is an innate weakness you must be aware of. A skilful opponent may fell you instead while you adjust yourself for a leverage advantage for the throw. But we are prepared. If the opponent does this, neutralize his move and attack him, like using a knee jab for example. Grandmaster Wong shows the innate weakness when implementing a throw, and demonstrates how to counter your opponent if he exploits that weakness. This is turning a weakness into an advantage, or overcoming a trick with another trick. Of course, you have to be prepared beforehand in order to be successful. A practitioner and Dr Damian practice the principle of turning a weakness into an advantage, or the principle of using a trick to overcome a trick. As Dr Damian exploits the opponent's innate weakness in his felling technique, the opponent turns the table round and kicks at Dr Damian. The size of the video clip is 0.39 mb. Grandmaster Wong explains that Boxing is close to the Monkey Style. Charles uses Monkey techniques effectively to subdue the Boxer. Notice that Charles cover himself well as he moves in to attack. When an opponent executes a powerful undercut, a good response is to brush it away following its momentum, using a pattern called “Enter Sea to Search for Shells”. This will result in closing an opponent. Then move in with an appropriate attack. Strategy of Letting Trick Manifest Trick from Wong Kiew Kit on Vimeo.